Are you interested in becoming a vendor at our 5th Annual Barn Burner BBQ? We would love to hear from you! 2. Space is limited. Priority will be given to vendors already featured in the Farm Store followed by application date. 5. Power will be available for vendors providing hot samples. Please bring your own equipment and extension cords. 8. All food and beverage vendors are required to have Fraser Health documents and permits submitted for approval no later than June 21, 2019. 9. All successful applicants will be contacted no later than May 31, 2019. 10. Payment will be required once vendor has received confirmation. 11. Sorry no 3rd party sales, or MLM. Barn Burner BBQ is back for our 5th year! This legendary event is presented by Johnston’s Pork and Fraser Valley Specialty Poultry. Join the festivities on Sunday, July 21st from 10:00 am to 4:30 pm at the Farm Store in Yarrow. This annual BBQ competition has become Chilliwack’s tastiest community event, promoting tourism in the Fraser Valley while spreading the love, passion and joy for “southern style” BBQ. Fall off the bone BBQ samples awaits, prepared by fiercely competitive Pit Masters from across Canada and the Pacific North West. Beef Brisket, Pork, Chicken and Ribs; all slow cooked to perfection! The event will feature food trucks, sponsor exhibits, live music, a kids’ zone, a climbing wall and more. 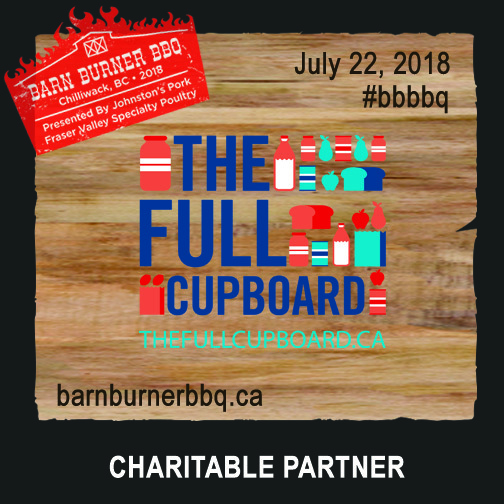 Entry to the event is by donation with ALL proceeds going to Envision Financial’s The Full Cupboard, a community program designed to raise food, funds and awareness for food banks in local communities. BBBBQ 2018 raised a total of $9,593. Help us meet our fundraising goal of $10,000 at BBBBQ 2019! 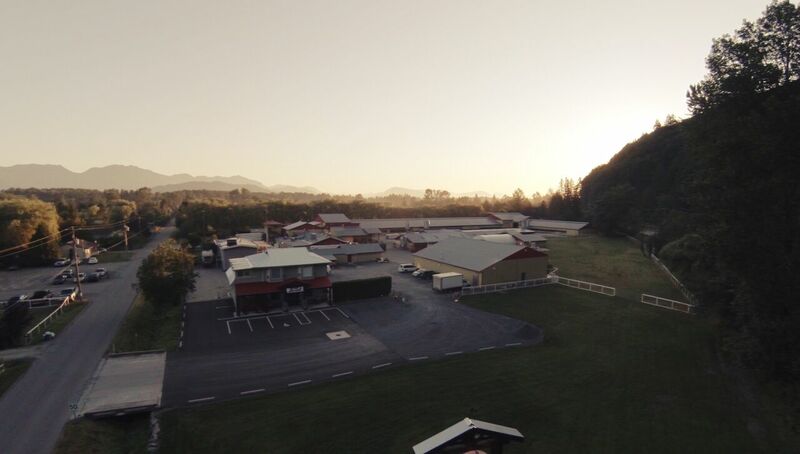 4540 Simmons Road, Chilliwack BC. Stay current on event details and team roster. [Chilliwack, BC] The 4th Annual Barn Burner BBQ (#BBBBQ) competition, presented in Chilliwack by Johnston’s Pork and Fraser Valley Specialty Poultry was a huge success. Eighteen teams competed for the Grand Championship which was captured by SmellaQue from Calgary! Competing in their first Canadian Competition, Booties BBQ from Washougal, WA. took home the trophy for Reserve Grand Champion. An estimated four thousand visitors braved the heat and came out to enjoy the food, learn about BBQ competition, and to take in live entertainment. Admission was in the form of donations. $9,440 was raised for Envision Financial’s The Full Cupboard, a program designed to raise food, funds and awareness for food banks in the communities where Envision Financial operates. A special thanks to our Black Box judges who judged BBQ entries entered using this year’s mystery ingredients including fresh duck breast and pork sirloin. The winning entry for the Black Box competition and Chef’s Choice was created by Braii-Q from Richmond, BC. The 2018 Barn Burner BBQ competition was furnished by Johnston’s Pork and Fraser Valley Specialty Poultry. The event was partnered and organized by Angie Quaale of Well Seasoned Gourmet Food Store, with additional support provided by Envision Financial, Old Yale Brewing, Twin Maple Construction, Double G Cattle, Grand Pappy’s Home Furniture, The Big Green Egg, BC Chicken Marketing Board, Hi Pro Feeds, Tractor Grease and the Tent Guys. Counting Down to the 4th Annual Barn Burner BBQ!!! Less than 3 weeks to go!!! Since being launched in 2013, the Full Cupboard has raised over $537,688 and collected 69,625 pounds of food! On July 22nd, with the help of our friends at Fat Wally’s Firehouse BBQ, we’re setting our sights on raising $15,000!!! As you know, The Barn Burner BBQ is FREE to attend and will feature 3 live bands, wall climbing, face painting, animal balloons, rubber duck races, an axe throwing tournament by Axewood Crew, food vendors, food trucks and more. This year, we will be selling SAMPLING WRISTBANDS at a minimal cost of $5 with 100% of proceeds going to the Full Cupboard. The wristbands will allow you to sample the BBQ competitors product AND you will also be entered into a draw to win a Back Yard BBQ for 10 people, catered by Fat Wally’s Firehouse BBQ!!!! Wristbands are limited so come early and get yours!!! CLICK HERE to Register for Barn Burner 2018! 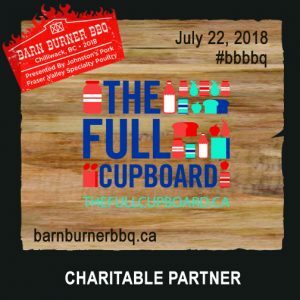 [Chilliwack, BC] Mark your calendar for the 4th Annual Barn Burner BBQ, July 22, 2018. Hosted by The Farm Store In Yarrow, and co-presented by Johnston’s Pork and Fraser Valley Specialty Poultry, this family-friendly BBQ extravaganza is officially sanctioned by the Kansas City BBQ Society. Free-to-attend with tasting wristbands available at a minimal donation with 100% of proceeds going to the Full Cupboard, a program designed to raise food, funds, and awareness for food banks in Chilliwack, Abbotsford, Langley, Surrey and surrounding communities. Chef Dez returns as the event emcee, while meat lovers of all ages are invited to join the festivities including a live band performance, climbing wall, face-painting and samples of delectable BBQ meat. If the samples don’t quite fill you up, a food trucks will be on-site selling even more BBQ. BBQ is NOT grilling! There is a very distinct difference between the grilling and BBQ. Southern style BBQ is a technique in which meat is cooked at low temperatures (about 225 F) for a long time over indirect heat. The heat source is charcoal and wood. No gas/propane is allowed. The Barn Burner BBQ competition consists of four main categories: Beef Brisket, Pulled Pork, Chicken, and Ribs. Brisket is cooked for up to 16 hours. Ribs take approximately 6 hours and chicken take as long as 4 hours. Sunday, July 22 – 10:00 am to 4:30 pm at the Farm Store, 4540 Simmons Road, Chilliwack, B.C. The 4th Annual Barn Burner BBQ Competition presented by Fraser Valley Specialty Poultry & Johnston’s Pork will offer $5000 guaranteed in prize money! Competition BBQ is rapidly expanding throughout North America, don’t miss your chance to get in on the action. BBQ lovers of all ages are invited to join the festivities including a live band performance, climbing wall, face-painting and free samples of delicious BBQ meat. [Chilliwack, BC] The third annual Barn Burner BBQ (BBBBQ) competition, presented in Chilliwack by Johnston’s Pork and Fraser Valley Specialty Poultry was a huge success. Admission donations from thousands of attendees raised $5,700 for The Full Cupboard, a program designed to raise food, funds and awareness for food banks in the communities where Envision Financial operates. A special thanks to our Black Box judges who judged BBQ entries entered using this year’s mystery ingredients including: fresh duck wings, smoked garlic pork tenderloin, and refried beans. The winning entry for the Black Box competition was created by Prairie Smoke & Spice: Lime and Garlic Pork Tacos with Smoked Duck Crackling. The 2017 Barn Burner BBQ competition was furnished by Johnston’s Pork and Fraser Valley Specialty Poultry, and the event was partnered and organized by Well Seasoned Gourmet Food store, with additional support provided by Greystone Promotional Products,West Coast Reduction LTD, Chilliwack Progress, Twin Maple Construction, Envision Financial, Crown Packaging, 100% BC Beef, Big Green Egg and Hi Pro Feeds. They better start training for the big day! Think elastic waistbands!